“The Future is About Knowledge Not Information” Bibliotheksmetamorphosen 2: Bibliothek 4.0. Winterthur, Switzerland. Abstract: The role of the public library as a place to collect and distribute information seems like an obvious success strategy for an increasingly connected and digital world. Yet there are many players doing this well beyond the capability of libraries. Could it be that the future is not about what libraries collect and distribute, but in how they help people learn from the torrent of information about them? This talk will look at how a shift away from containers and information to learning and knowledge not only situate public libraries for the future, but is the key to any successful industry of tomorrow. I was asked to prepare my remarks ahead of time for translation. This means I need to read them. Watching me read things is boring, so I have provided some more interesting pictures to look at. Now you can just enjoy the pictures. This is a dangerous question for a geek professor from the states. First it almost begs me to dream in flying cars and futuristic scenarios where we all interact with devices implanted in our brains. What’s worse, this talk is being presented in Switzerland, and from a United States perspective I feel somehow obliged to be amazingly scholarly and reserved. What I will talk about today are my guiding principles to bring about Asimov’s “good future.” A future where the boundless passions and capabilities of our communities are unleashed by librarians. This is not about maker spaces, or flying cars, or augmented reality in the stacks. All those things may well be a part of tomorrow’s library. However, they should only be there if they match our ultimate mission. The mission of librarians is to improve society through facilitating knowledge creation in our communities. Or put more simply, we help communities make smarter decisions, and those decisions in turn lead to a better tomorrow. How do librarians do this? Well, in many cases we build and maintain libraries. Libraries are community owned platforms, mandated by that community, and curated by library professionals on their behalf. Libraries may be buildings, and may be books, and may have maker spaces. None of these services define the future, however. The future is defined by the dreams of the community. For us to ensure great libraries for our communities we must, as librarians, become a missionary force. A profession of facilitators that go deep into the uniqueness of our communities, enabling that diversity to foster all sorts of innovation. I will takes these in turn. Let me start out with the required provocative statement: I believe that information will kill librarianship. I am not talking about the amount of information. Librarianship will not breathe it’s last because of too much information. We no longer talk about information overload. Why, because the mass of digital information that was once seen as overwhelming, has been tamed with the use of smart devices and the development of content filters, often self-imposed, that restrict our views to relevant information. We will come back to the consequences of that filtering in a bit. I am also not talking about new forms of information access that will be the death of librarianship. This will not be a talk about how Google, or Apple, or Amazon will put libraries out of business. They haven’t and they won’t. Will fake news and the fragmentation of the information landscape kill librarianship? Ah, now we are getting closer. But it is not fake news or fragmentation themselves that threaten the future of librarianship, rather it is understanding how librarians play a role in responding to these things. What I am talking about is that information as an organizing philosophy and core concept of the field is the threat. Let me explain with a little history. All living disciplines change and respond to changes in a larger culture or society. Farmers, for example, may have been around for millennia, but a farmer today no longer functions on the same core beliefs as his or her predecessor. Where once farmers waited for the seasons to dictate crop yields, today’s farmer is proactive picking crops based on forecasts, market forces, and the availability of fertilizers. Where once farmers slowly bred new varieties of plants, today’s farmer is intertwined into complex genetic experimentation and the design of new crops. Technology has transformed farming from a labor-intensive activity of small farms to an industrialized sector with global reach. As it is with farming, so too is it with librarianship. Today’s librarians share a lot with those who had the title over the past 4 millennia. However, we have changed the underlying concepts that guide us. Libraries as closed stacks curated by scholars gave rise to a new populism that saw libraries as a way to educate the masses. Public libraries grew out of social movements aligned with a growth in democracy and an expansion of rights to the general population. Much of how we think about libraries today was crafted at the end of the 19th century when industrialization thrust concepts of efficiency and standardization into our consciousness. This new industrialization was met with changes in technology, specifically the dramatic decrease in the costs of printing, to put in place concepts of book palaces. Growth in guilds and labor movements saw the professionalization of the librarian. Most libraries of today have adopted a new perspective grounded in technology, data, and information. This is not surprising given the amazing advances in the field of information science, telecommunications, and computing. Librarians have come to see their jobs as informing users and serving customers. We all too often forget that our job is not to inform a customer, but to improve the life of a person. We cannot, as an example, confuse access for impact. Giving an article to a person who cannot read, or providing internet access to someone who is computer illiterate is an act of access with no impact. No impact, other than making the person feel inadequate. Informing as an act of access, or informing as a means of collecting and analyzing data does not meet our mission. Seeing people as users collapses complex human beings down to an information processor in relation to a system. They use a computer, they use a library. To meet our mission and to bring about our good future, we need to know more than what or how they use something, we must see people as makers of meaning. In Madison County New York, the librarians of the Cazenovia Public Library sought to improve the life of families in poverty. They set up reading programs in a local food pantry. At the end of several weeks the director, Betsy Kennedy, gave each child a new book. As Betsy handed a book to one small girl, the girl began to cry. When asked what was the matter the girl said this book was the first new thing she had ever owned. That program was not about giving information in book form to the girl. The program was not about informing the girl. It was about improving the girl’s life. They had done so not only in their outreach, but in showing the girl she was worthy of a new book. She was worthy. They later expanded the program to provide education and training the parents who came to the food shelter. They then expanded the program throughout the county in food pantries, libraries, and churches. These families were not users, nor customers, but neighbors. The librarians sought to not only inform their neighbors but to demonstrate that these people had worth, and facilitate these families in making meaning of their lives. The library was not a source for access, but a platform to create a future. In Cuyahoga County Ohio, the public library runs many branch libraries. One of these branches is in a prison. Behind bars librarians provide training and materials. When an inmate is due to be released the librarians set up appointments with a local branch librarian. There the former prisoner can not only check out books, but enroll in job training. It is not the goal of a librarian to provide prisoners with information, it is to provide them with hope and a sense of personal worth. In doing so they seek to decrease recidivism rate, and future incarceration. They are helping that person, and they are helping the community as a whole, and they are helping themselves because the librarians are demonstrating their value and improving a community of which they are a part. A focus on library as information provider is both an abdication of the role a library plays in our communities and puts us in competition with tool makers. A focus on books circulated, pages transmitted, people in a building are easy counts that miss the larger goal. In our good future, we must traffic in the improvement of lives, not the caretaking of information. Google, Amazon, Apple, all of these are excellent tools to help us do our jobs. Just as books, buildings, computers, and 3d printers are tools to help us do our job. The goal is not the tools. We are not caretakers of tools, but advocates of our communities. All too often we have adopted an information perspective that merges data with knowledge, books for knowing, and bits for thoughts. We see this in how some approach the question of information literacy. The problem of fake news and the role of foreign powers in using social media to influence elections is important. However, in our discussion of solutions we give too much power to information and data, and indeed to those who seek to manipulate us. The real problem with fake news is not intentional misrepresentation of news for political or financial gain. That has been with us forever. The real problem is a fracturing of commonly held beliefs and values within our communities. People are more likely to believe and seek out conspiracy theories and false narratives in the absence of a community held narrative. Nationalism and xenophobia grow when we allow communities to mistrust each other. The solution to rising extremism is not better identification of dates and authors, but bringing diverse community members together to learn and respect one another. In essence, information literacy needs to be less about sources and more about conversation. Less about data and more about trust. Knowledge is information with a social mission and action. This leads me into my second principle: The future of libraries is not neutral. And here is where we face the obvious. If you are going to talk about a good future, you have to define what good means. In doing so, you cannot be neutral. If you think a good future is one that uses tax dollars to support libraries? You have a point of view. If you feel more people should read? That too is a bias. Further, do you see the importance of literacy as a function of democratic participation and/or workforce readiness? Those are points of view, and not neutral. During the recent refugee crisis in the European Union we saw librarians taking in displaced peoples. We saw librarians go out to refugee camps and offer services. When they did so, they were not neutral. Elements of EU communities very much objected as part of the rise of nationalism and xenophobia. These same forces of xenophobia and nationalism are seen in the US where libraries provide library cards to undocumented peoples, and where public libraries provide food support to any comer much to the irritation of nationalists. The librarians are acting out of a bias towards inclusion and service, and that will only become more uncomfortable in our increasingly polarized communities. I want to be clear, I am talking about libraries being principled, not ideological. For me the good future for libraries involves an organization staffed by principled professionals working in the best interest of their communities and fighting for a vibrant public sphere. Librarians must counter discrimination in all its form. Discrimination based-upon race, gender, sexual preference, and religion (among others) stands in direct conflict with the underlying values of librarianship. We seek to provide physical and intellectual safety to our communities. We seek to become safe places to explore dangerous ideas. We believe that different views must coexist in an atmosphere of mutual respect. There are those who feel that libraries must be passive, public servants bowing to the will of the people. This is not the role of a professional, nor should it be the role of any member of the community. Librarians should seek to shape the narratives and values of the community just as we expect all sectors of society to do so. There are those that feel libraries, particularly public libraries, are incapable of shaping communities. That libraries are agents of a larger system of neo-liberal corporate and political interests and thus unable to bring about change. I say this is the worst form of pessimism, and ignores the impact of libraries and librarians throughout history. In the 1800’s in the US there were many articles and editorials attacking libraries as including seditions and salacious materials. The thing they were worried about? The media that would have young girls thinking beyond their station, and farm boys beyond the farm? The materials that appealed to fallen ladies and denizens of the night? The literary novel. Today we take for granted that fiction and literary novels are part of library collections. We take it as an assumption that literacy and story-telling are what librarians do. Yet that only happened because librarians chose to stock the materials, and defend them. How we view the public library of today is not an accident, or solely a result of outside influence. Librarians and library staff have continuously honed a vision of librarianship around diversity and narratives for centuries. And we must continue to do so. We must recognize that while libraries should be a safe place to explore dangerous ideas, they will only be so if we make it happen. Our ideals trapped in a building are as useful as food stocked in a store. If we limit our services to those who can afford it, find it, or those that already feel welcome, we will leave parts of our communities to starve. In Topeka Kansas, the librarians partnered with schools, and charities to ensure all children were ready for school. As they planned events, tutoring, and programs it became apparent that the neediest members of the community would never benefit from such efforts in the library. These communities were trapped in economic isolation with little to no transpiration to get to the library (or jobs or services). These primarily minority communities were trapped in neighborhoods with little nutritious foods, few jobs, and little ability to escape. So the librarians approached busing companies, and sought to find means of transportation. When that wasn’t enough they trained their librarians and community volunteers in literacy and sent them out of the building and into the streets of need. In my own state of South Carolina and in the northern reaches of the Netherlands, librarians have equipped busses with maker spaces, materials, and experts to go to the people in need. They do this not out of a sense of neutrality, but out of a sense of idealism and activism. The problems our communities face are too important and too entrenched to solve as neutral servants within a building. The needs and suffering of our communities require empathy and passion. What we are bringing to these people is not information or materials, but hope and self-worth. Librarianship is a promise to communities that they are worthy, that learning is a key to happiness, and that all people, no matter their color, or wealth, or politics deserve support. And this then brings me to my third principle on how we do this: The future of libraries is local and networked. Switzerland is not the United States of America. It is not Kenya, or Tokyo. The cities and villages of this country are unique. A key part of the passionate caring good future of libraries is in embracing this uniqueness. Some communities aspire to growth, others to economic well-being, still others to a rural lifestyle, or quality of life issues. For some education is a barrier, for others an asset. Our libraries must look and act like these communities. I do a fair amount of international traveling. I am often fortunate enough to spend some time sightseeing and being in these communities. Some folks in this situation seek out museums, or monuments. I seek out grocery stores. I realize this is odd. Why grocery stores, aside from a clear problem with buying sweets? Because I have found no faster way to discover the similarities and differences in culture. For example, just about every country’s stores will have bottled water, bread, and cereal. However, when I walked into a grocery store in Beijing, I found a seafood section that to my American eyes looked more like an aquarium. Live shrimp flipping out of bowls, blowfish, and a huge number of living fish I couldn’t begin to identify. In the UK, the milk is warm. In Sweden, most of the candy comes in the form of gummies. I find it fascinating. Then I walk into the libraries. Big reference desks, stacks of books, some reading space. Certainly, the architecture varies, from renaissance rooms in Italy, to shining steel and glass atriums in Scandinavia. However, how different are they really? The future library needs to look like its community. Not only in the architecture, but the collection (if there is one) and the services it offers. In the tribal lands of Kenya, libraries keep a collection of tribal robes. These robes are not for display, but use. In the river country of Wisconsin, librarians loan out fishing rods. In Fayetteville, NY an educated community can check out electronics and telescopes. Their collections are shaped by the learning of the communities. We must also take this localization a step further. We must realize that the community is the collection. In Pistoia, Italy the San Giorgio Library has become the new piazza, or central square for the city. Each week they host dozens of programs where members of the community share what they know. Social workers and iron smiths demonstrate their expertise. Citizens gather for movies and talk about the daily occurrences in a café. 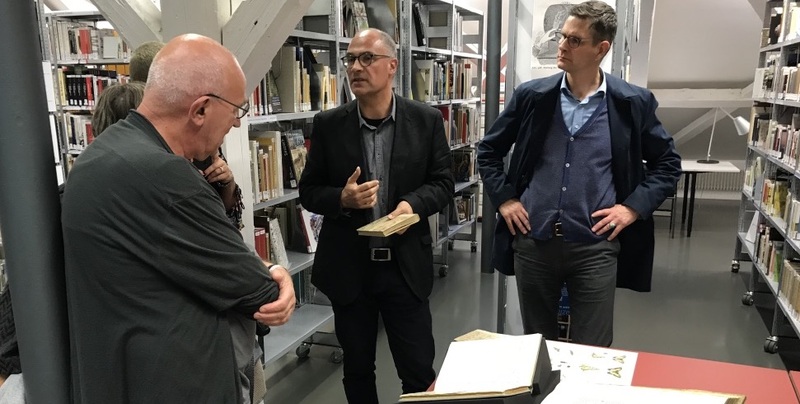 In Tilburg, the new library is being built in an old train repair factory – helping to transform the historic industry of the city’s past into an economic engine for the future. The library sits beside, and sometimes within, incubator space for new companies. Our libraries and their offerings must be as diverse and unique as the communities we serve. We must think very locally. What is considered good, and knowledge, and aspirations must be tied to the ground, not imposed from an international discipline. In order for this to succeed, however, no library is an island. These very local libraries must be networked. Here I am not talking just about data, and fiber, and the internet. I mean you. It is your job as librarians to seek out the best idea from other libraries, industries, other cultures, and other domains, and contextualize them for your community. Not every library needs a maker space. Those that do may consist of 3d printers, or sewing machines, or recoding studies. It your job to adapt not simply adopt, good ideas for the good of your people. There is an old joke in technology, that IT never says no, they just how three letter acronyms at you until you stop asking. I am convinced there is a library equivalent. Librarians never say something is a bad idea, just that it is a good idea for someone else. Too often this leads us to compartmentalize the field. I’m not a librarian, I’m a public librarian. I’m not a public librarian, I’m a public services librarian, and so on and so on. We must realize that we are all librarians and we can learn from each other. I should take a moment to say I have a rather broad definition of librarian. If you were hit by a bus and the library can’t function…you’re a librarian. So there are my three principles for inventing our “good future” for libraries. Focus on knowledge and impact, not information and data. Be an agent for positive change, and don’t hide behind illusions of neutrality. And build locally while connecting globally. How does this look in your library, in your community? That’s very much a conversation you have with your public. Will this future involve technology? Yes. Do librarians need to be well versed in internet tools and even data mining? Yes…not all, but some. I end my remarks with an invitation. An invitation to join a new school of thought in the field, what many of us are calling the Knowledge School. This is not an academic unit in a college, or a place. It is not an association. Rather it is a movement. It is a movement around progressive librarians committed to improving society. It is a network of experts, scholars, practitioners, and allies. The Knowledge School seeks to link together change agents in libraries, government, and industry. It seeks to lay out an agenda to ensure librarianship remains relevant, and our communities vibrant. The Knowledge School exists at the University of South Carolina and the Frysk Lab of the Netherlands. It is in the work of the Fayetteville Free Library and Chattanooga Public Library. The Knowledge School is in the streets of Toronto where librarians park Wi-Fi enables cars to provide service to neighborhoods. It is in the mountains of Switzerland and the marshes of Thailand. The school consists of librarians in large and small libraries, urban and rural. The Knowledge School prepares librarians, information specialist, number crunchers, business leaders, and community educators. We send them to libraries and schools, fortune 500s, think tanks, & startups. We put information into action. We change the world. We are a movement. We are the knowledge school.